Minerals are Vital to Our Life – Are You Getting Enough? Consider this, in 1948 a cup of spinach had 158 mg of iron. In 1965, a cup of spinach had only 27 mg of iron. Today, a cup of spinach has 2 mg of iron. You would have to eat 79 cups of spinach to get the same nutritional content from food just over fifty years ago! Is it any wonder why, we are not as healthy as our grandparents? I believe that whole food nutritional supplementation is not just an option anymore – it’s a requirement if you want to be healthy. Minerals are extremely important to our health and wellbeing, they are integral to our vitality. The average American is severely deficient in minerals. Almost every reaction in our body requires minerals to work as a cofactor. Did you know you can drink half your body weight in ounces in water every day, and still not be properly hydrated? If you don’t have enough minerals you won’t be able to retain the water in your cells. 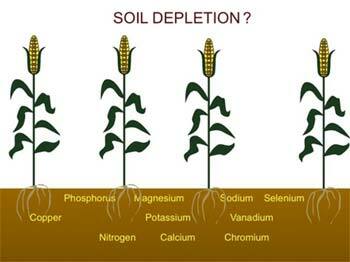 Most of our vegetables today are extremely deficient in trace minerals. A book called Empty Harvest by Bernard Jensen talks in depth about this. This deficiency has a lot to do with how we farm today. Traditional farming would rotate crops and compost the unused vegetables back into the soil. In todays mass farming where we keep the same crop on the same land and of typically only put Nitrogen, Phosphorous, and Potassium back into the soil. There are literally dozens of trace minerals no longer in the Standard American diet. In addition, research done at my alma matter Rutgers University showed organic produce has anywhere from 3 to 200 times as many minerals as commercial produce. For example, the commercial lettuce had less than 1% of the iron as compared to the organic lettuce. Organic is healthier for you! Deficiency in minerals creates a failure in our bodies to neutralize excess acid, which creates more inflammation in the body, and inflammation leads to degenerative disease. Mineral deficiency also is a leading cause of anxiety. It is amazing to watch my patients with anxiousness heal with adding minerals back into their body. In my practice we take a detailed history to see what the underlying cause of your ailment may be, and feed you back to health with whole food supplements. An easy way to check your mineral status is to measure your urine pH first thing in the morning. It should be between 6.4 and 7.0. When your pH is acidic you tend to feel lousy, fatigued and pessimistic. When your pH is optimal you are full of energy, happy and joyful. Make sure you are full of high quality minerals so you can have a high quality life!